You know, the amount of time I spend in the kitchen is inversely-proportionate to the amount of time I spend exercising. There are only so many hours in a day after all. So if there’s been a spate of relentless cooking or baking, it is safe to assume that I haven’t been exercising much (and shall soon be facing the natural consequence of eating more and exercising less). But if I haven’t been cooking much, it doesn’t necessarily mean I’ve been exercising more. It just means I haven’t been cooking much. Lately, I’ve actually been trying to eat a little healthier, so my kitchen has been seeing a lot more fresh and steamed veggies, fish and chicken breast. Not too exciting. And I’ve been craving local hawker fare for some reason. Anyway, this was dinner last night. We’ve been cooking dinner for my in-laws the past couple of weeks since my mother-in-law recently had surgery done on her right shoulder. My father-in-law is a big fan of spaghetti. So I made this seafood spaghetti yesterday with him in mind. This is good stuff. But make the prawn stock. You won’t regret it. It makes all the difference. Poach prawns in water with shells on, till cooked. Remove from water and shell them. Set aside heads and shells. Slit backs of prawns and de-vein. Set aside. Return prawn heads and shells to the poaching water, bring to boil and simmer for about 30 minutes to make prawn stock. Strain stock. Set aside. Cook spaghetti in a big pot of water, with 2 tsp salt added, on high heat so it’s bubbling, until it’s almost cooked but not cooked through, and then drain. In a skillet, heat enough olive oil to coat the entire surface of the pan at medium-high heat. Pat salmon dry and toss in some salt to season. Place salmon cubes into skillet to cook one side at a time till browned on the outside and cooked through. Do not overcook. We want it done medium, not well-done. Remove from skillet with a slotted spoon. Set aside. Put squid rings in the same skillet, saute quickly till just cooked, and remove with slotted spoon. Set aside. In same skillet, saute chopped garlic till cooked, then put in the chilli and saute for a couple of minutes. Put in the prawns and turn them over when they just start to curl on the first side, and then allow them to curl on the other side as well before adding about 4 ladles’ worth of prawn stock. Return squid and salmon to the skillet. Be gentle with the salmon – try not to let them flake or break up. Allow everything to simmer in the stock for couple of minutes and then season with salt. Add the spaghetti to the skillet and mix well, then allow to simmer in the stock for a bit. Add more stock if it is too dry (there should be some liquid at the bottom of the skillet). Toss once or twice while simmering. Once spaghetti is cooked, add salt and black pepper to taste. Serve sprinkled with chopped Italian parsley. The H requested we have pasta for dinner before this evening’s race. I did a quick check in the fridge and I was pleased I could use up various stray ingredients accumulated over the past couple of weeks: A handful of button mushrooms, 200g of bacon (cos I accidentally bought more than I needed for the boeuf bourguignon on Mom’s birthday), 3/4 can of diced tomatoes, about 2 cups of tomato sauce, a few tbs of tomato paste, some sun-dried tomatoes and some capers. We ended up with this yummy spaghetti which had us going back for seconds and thirds. Halfway through dinner, my daughter asked if we could have this for dinner again tomorrow. Pleasing them pleases me. Heat 1 cup olive oil in a skillet and saute 3 tbs chopped garlic till cooked. Add about 200g sliced bacon and saute for about 2-3 mins, then add sliced mushrooms and saute till browned. Stir in finely-chopped sun-dried tomatoes and capers, diced tomatoes, tomato sauce, about 2 tbs tomato paste, and simmer, stirring, until diced tomatoes are softened and sauce is thickened. Cook 350g spaghetti in a pot of water with 1-2 tsp salt over high heat. Once spaghetti is cooked, drain and toss well with the sauce and 2-3 tsp chopped Italian parsley in a large bowl. We had the pleasure of hosting dinner on Saturday for some awesome people who’d played a significant role in my life as I matured professionally. It was all pretty relaxed, and we had a really nice evening with them. But since I’d been cooking and baking for a good part of Friday afternoon, and cooking and eating again on Saturday evening, I didn’t feel like fussing over dinner on Sunday. So with some lumpfish caviar we had in the fridge, some fresh basil and chopped garlic, I put together an easy 15-minute pasta for Sunday dinner which still made us feel rather spoilt. Boil pasta in big pot of water with 1 tsp salt until al dente, then drain. In the meantime, heat up olive oil in a skillet, then saute chopped garlic till cooked. 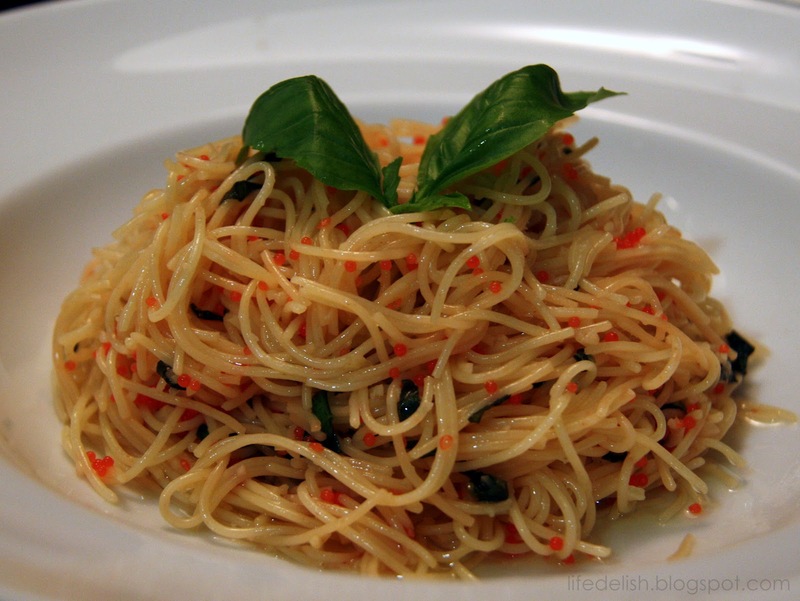 Toss hot pasta in a large bowl with the cooked olive oil, garlic, caviar, and basil leaves. If too dry when tossing, add a little of the water which the pasta had been cooked in. Pasta is one of those things we can whip up with very little preparation time and with just some basic ingredients which we’re likely to already have in our fridge. And dried pasta stores well. So I always stock up at least 3 different kinds. Certain shapes go better with certain sauces because of the way that the ingredients in the pasta sauce adheres to or gets picked up by the pasta, or because of their texture. But then it does boil down to personal preference. At the moment, there’s some Spaghettini, Squid Ink Spaghettini, Tagliatelle, Parppadelle, Macaroni and Penne in my larder. The egg tagliatelle would go with cream sauces or egg sauces, whereas for aglio olioor white wine sauces, we’d use spaghettini. The kids prefer the shorter pastas, which I assume is because it’s just easier to eat. Those tend to go well with tomato-based sauces. We had some friends over for dinner last Saturday. It was an impromptu thing we arranged on the day itself. After our morning picnic at Botanic Gardens (which was adjourned to Hort Park after it began to rain), we dropped by at my favourite supermarket. I’d already planned on making breaded chicken breasts seasoned in herbs and stuffed with bacon and cheese (my take on Chicken Cordon Bleu), with some salad and sweet mango on the side. But the Tiger Prawns looked really compelling that day – so fresh, large and plump – so I decided we’d have them as well, in spaghettini with a sun-dried tomato and black olive sauce. This pasta dish is easy enough to prepare on a week night. At the same time, it’s lush enough to have with a glass of wine when you feel like spoiling yourself or when you’re entertaining. Especially if you have fresh large Tiger Prawns like we did. Heat 2-3 tbs olive oil in a large skillet on medium-high heat. Pat prawns dry, then place on skillet to cook, one side at a time, turning when they are cooked halfway through. Allow prawns to be seared, but reduce heat before they start to burn. Remove prawns with slotted spoon when they are just cooked through, and set aside. Add remaining olive oil, butter, garlic and shallots to the skillet and saute till softened. Add sun-dried tomatoes and saute till softened. Add chopped/diced tomatoes, chili and black olives, and cook until sauce thickens. Stir in chopped basil leaves. Stir in prawns (including any drippings/juice) and season with salt and black pepper. Meanwhile, bring large pot of water to a boil, with 3 tsp salt added. Cook pasta until al dente (tender but firm), then drain. Add cooked pasta to the skillet and combine with the sauce. 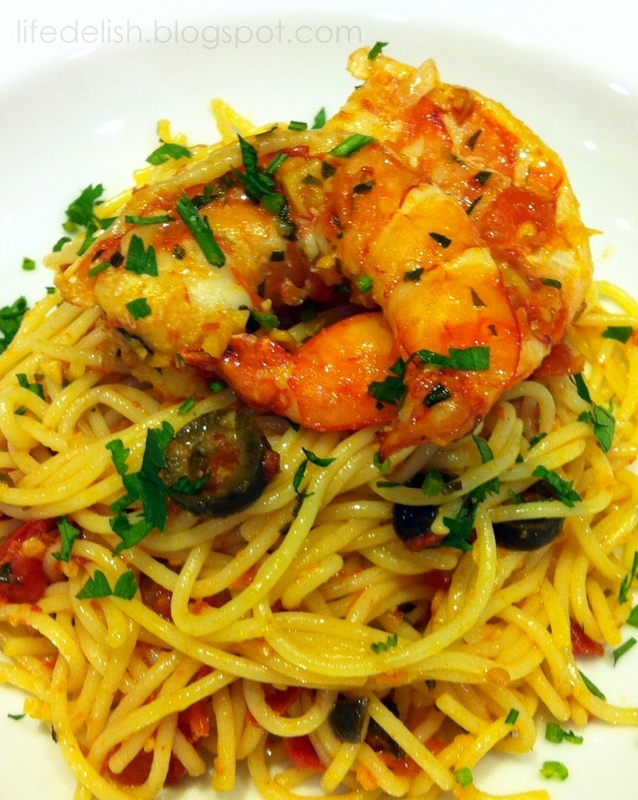 Dish onto plates, arranging prawns on top of pasta, and sprinkle with cheese and chopped Italian parsley. During weekends, we usually spend the day out with the kids, and if there are no dinner plans, I usually prefer to cook something simple at home, rather than da bao (takeout). We used to think nothing of it before the kids came along, but this has become somewhat of an exception now as I’ve become more conscious of what goes into our diets. Today, after a morning of go-karting at West Coast Park, we had a fast food lunch as a treat to the kids. So all the more I thought we ought to balance things out a little with a relatively healthy dinner. Feeling tired and a little lazy, an easy one-dish pasta meal seemed an appealing option. There is usually some Salmon fillet in the freezer, and there is always dried pasta in the larder. 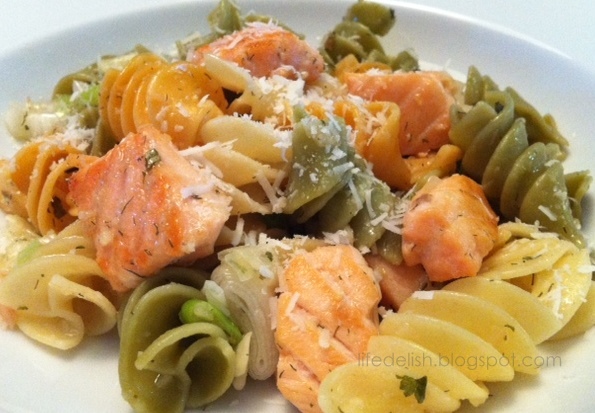 Salmon and Leek with Fusilli is one of the current quick and easy staples from my kitchen. It’s easy to prepare, tasty, convenient to eat if you’re in a hurry, and best of all, makes for a healthy meal. It’s not anything special, but I just thought I’d share this as an easy meal you could prepare on a week night. Takes about 30 minutes. Put a large pot of water to boil. Add 2 tsp salt. Cut salmon into 1 inch cubes. Season with salt. Cook pasta in the pot of boiling water. Remove and drain once cooked. In the meantime, heat olive oil in a large skillet on medium high heat. Cook salmon, first on one till browned, then turning over (adjust heat if necessary), until just cooked through. Remove with slotted spoon and set aside. Turn heat to low. Saute chopped garlic until cooked but not brown. Add leek and saute till just softened. Return salmon to skillet and toss gently for a couple of seconds. Turn off heat, add drained pasta to the skillet and toss gently with the other ingredients, adding chopped dill, parsley, and salt to taste. Be careful not to break up the salmon cubes. If you like, top with freshly grated cheese (I like Pecorino).